WUCF TV, a partnership of the University of Central Florida (UCF) and Brevard Community College (BCC), has officially been named Central Florida’s new home for the full PBS schedule. 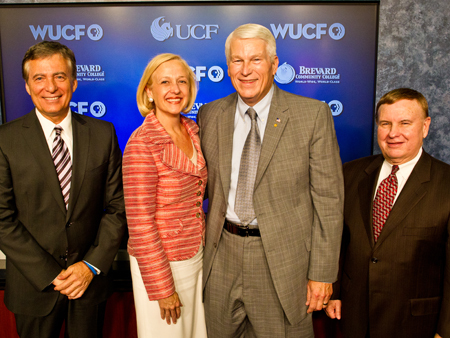 BCC’s television station, WBCC, will broadcast Central Florida’s primary PBS channel, WUCF TV, in high definition beginning July 1, PBS President and CEO Paula Kerger, UCF President John C. Hitt and BCC President James A. Drake announced today. WBCC also will continue broadcasting both partners’ institutional channels, WBCC and UCFTV. WUCF TV will broadcast PBS’ Emmy-award winning news and public affairs, history, drama and performing arts programming, including the PBS NEWSHOUR, MASTERPIECE and NOVA. The channel also will feature first-class local content about the Central Florida community. WUCF TV also will broadcast seven hours of PBS KIDS programming each weekday. PBS KIDS is the nation’s most trusted educational media brand and has been proven to help children succeed in the classroom and in life. The schedule will include such curriculum-based series as SESAME STREET, CURIOUS GEORGE, DINOSAUR TRAIN and many others. WUCF TV will be seen over the air on digital channel 68.1, the current position of WBCC. The UCF-BCC partnership is working with cable and satellite providers to determine the channels that will carry the new channel. More information about the partnership and its new high-definition channel is available on the WUCF TV website – www.wucftv.org – which launched today. The site will become a more robust source of information and news about WUCF TV in the coming weeks, as more details about the new channel are set. Public broadcasting supporters can make donations through the website beginning today. A membership plan is under development. WUCF TV can be contacted at wucftv@ucf.edu or 1-855-423-9823 (WUCF). BCC and UCF have a long history of working together and operating and producing programming for television channels. BCC has owned and operated a non-commercial television channel — WBCC — for more than two decades. WBCC broadcasts the UCFTV channel. WBCC first started airing PBS programming in January 2002 as one of the secondary channels in the Orlando market. WBCC and UCFTV will continue to provide high-quality local and PBS programming, remaining separate from the new WUCF TV channel. Just a few days after WUCF TV launches, viewers will be able to watch America’s biggest and brightest birthday party at 8 p.m. July 4. A CAPITOL FOURTH will feature unrivaled musical performances by some of the country’s best-known artists and the National Symphony Orchestra live from the West Lawn of the U.S. Capitol. PBS’ summer season also will feature MASTERPIECE MYSTERY! on Sunday evenings. HISTORY DETECTIVES, a show that proves once again that an object found in an attic or backyard might be anything, will air Tuesday evenings. GREAT PERFORMANCES will air a production of Verdi’s “Rigoletto” starring tenor Placido Domingo at 9:30 p.m. July 15. For images, video and additional up-to-date information on the PBS Summer 2011 season, go to http://pressroom.pbs.org/Programs/Summer-Season-2011.aspx.